Every batch is hand-signed, and even the alcohol percentage is handwritten on every bottle. Liquor and fruit? To most Americans, that’s as crazy as wheat germ with a side of fries. However, Europeans often pair the healthy with the good stuff. Think of crepe suzette or zabaglione. I remember my father eating a bowl of strawberries, red wine and sugar for dessert. And there are many cordials featuring bottles of brandy with cherries, peaches, and plums. But fruit with bourbon? That’s what Diabolique is. It’s kentucky bourbon, infused with fresh and dried figs, cinnamon and vanilla bean. And it was invented by Boston chef Robert Fathman and now sold by his company, Infusion Diabolique. It’s strong and not too sweet. Each bottle is signed by the craftsman and sells for about $35. But it’s available at only three liquor stores. 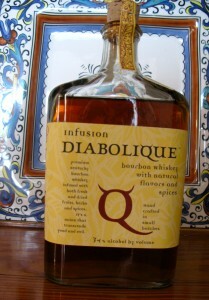 Take one third Diabolique, one third Campari, and one third sweet vermouth and pour over a glass of ice. Stir. Take the zest of an orange and squeeze it over a lit match held over the glass. A tiny stream of orange essence will make the flame spark, dropping a burnt orange flavor into the cocktail. Drop the zest into the glass and serve. For a more refreshing take on this, add a splash of soda water and serve in a tall glass.